7 X 14 V-Nose Trailer 7000 GVW, dual axels with electric brakes, 3/8 plywood, painted walls, rear ramp door, 32” side door, closed cell insulation, white luan ceiling and diamond plate floor. 125 amp load center, fluorescent and pull string light , 1500 watt wall heater, 110 v shorepower plug in, and 150ft #4/3 shorepower cord with breakers. Rolair 5 hp constant run vibration mounted compressor, refrigerant air dryer, regulators, filters, and separate lubricated mixer line. 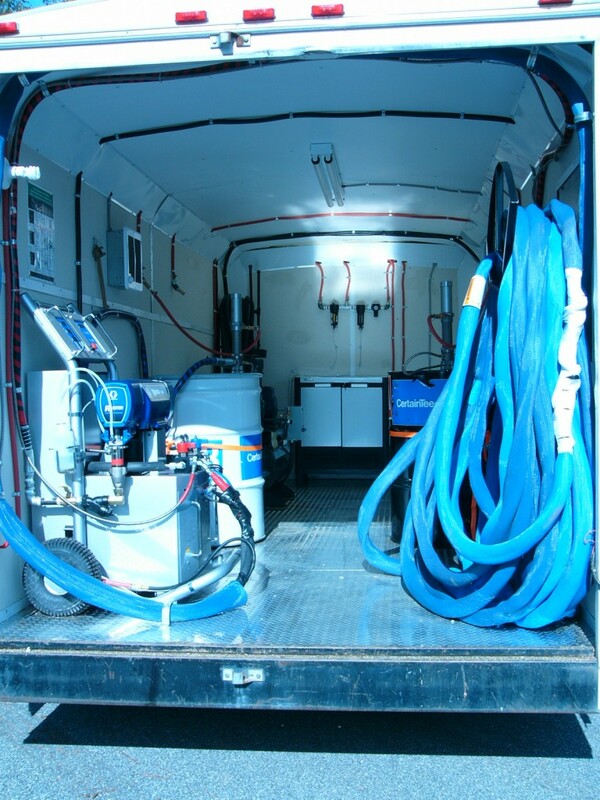 Graco E20 Electric Reactor, 150ft 3/8 heated hose, heated whip, Air Purge Fusion Gun, material recirculation /pressure relief lines, 2 Heavy Duty IPM 2:1 transfer pumps with hoses, tool box and custom hose racks. 25 tyvek suits, 3M respirators and cartridges, first aid kit, eyewash station, fire extinguisher, advance goggles, box nitral gloves and Allegro 1 man fresh air system with 150 feet of hose and full face mask. Labor to install, wet out and test all equipment. One day training at AIRS facility included. On-site training available.